It’s not often that a house is in the news multiple times over the course of 122 years, but it’s no wonder when one specific house has had 4 different physical addresses. The Martin Mayo House has been the topic of many articles in the Eliot News – most recently in the summer issue of the Eliot News (“Historic Martin Mayo House Slated for Demolition” and “Help Stop the Demolition of Martin Mayo House”). Since being built in 1896 by Martin Mayo, this home has been moved from its original location on the northwest corner of Union Avenue (now called MLK Jr Blvd) at NE Sacramento Street. In 1912 it moved around the corner on Sacramento to make way for an apartment building commissioned by Mayo to be built on Union Avenue. That building was called the Mayo Apartments for years and is still standing currently called the Union Manor Building. In 1930 it was moved to its current location at 206 NE Sacramento when Union Avenue was widened by 10 feet and all buildings were subsequently moved back. 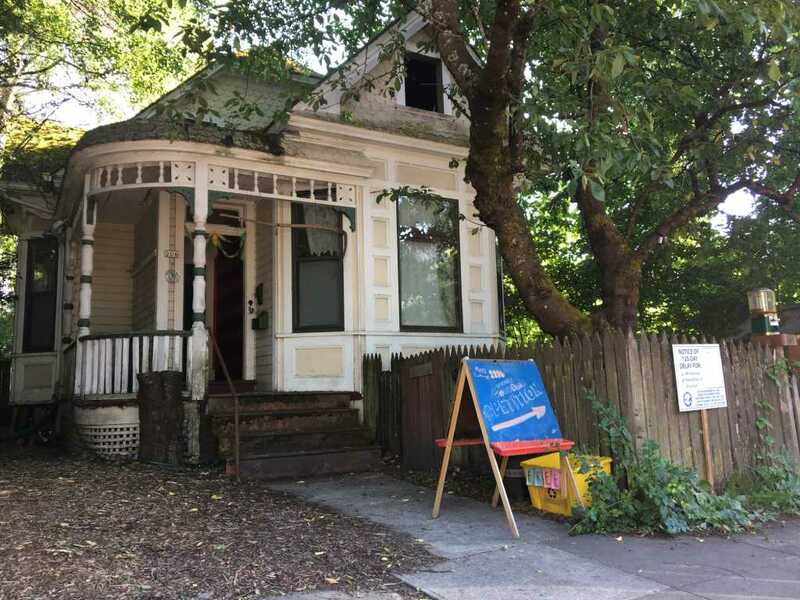 The Martin Mayo House has resided there for the last 38 years but now it has moved yet again to 236 NE Sacramento closer to its original location. Cleo Davis has purchased the Martin Mayo House. He plans to the set the house about 4-5 feet above grade to put a couple of apartments in the basement and then house the “ARTchives” in the main house. Eliot residents who took the time to sign petitions, attend design review meetings and email city planners will be happy that the house is being moved. Less fortunate are the urban forest and farm including a very old black walnut tree that is unable to be saved from removal. Developers tried to save the walnut tree but, according to arborists working on the development, in moving the house the tree would have to be trimmed so severely that it would cause it too much stress. We’ve been promised that a mature tree will be planted in its place. So, we can celebrate the success of a house moving for an incredible third time appreciating it’s being able to represent Eliot’s rich past and hopeful future for many more years to come.